Preventatives rarely stop cluster headache attacks altogether, but many do help to reduce the number of attacks and/or the severity of attacks.Any treatment that reduces the frequency and/or severity by 50% of greater is considered successful. Preventive medicines for cluster headache are borrowed from other primary indications, including anti-convulsant (anti-epileptic), mood stabilization, and blood and heart medications (calcium channel blockers). There are no prescription medications specifically indicated for Cluster Headache and there is no drug to cure cluster headaches. The cost/benefit ratio for big pharma to invest in novel treatments for .05% of the population is not a very compelling business case. However, leveraging prior work and existing medicines is common practice in the pharmaceutical industry and the ability to take an existing drug to market against a new indication, such as cluster headache, is very appealing from a cost/risk perspective. For this reason, several existing drugs have been evaluated in clinical study and others have been used off label to treat cluster headaches. You may find that your doctor adds medications more frequently than he/she eliminates them. As a general rule, these are powerful medications that carry with them some significant side effects. Some subtle and some right on the surface. It is a good idea to review all of your meds at every visit and eliminate any that are not working for you. You will likely find that getting to the right medication that works for you will take some time. Every medication switch requires a washout period for the prior drug and a titration (ramping up) period for the new drug. Getting to a therapeutic level of the medicine in your bloodstream can require blood testing and dosage adjustments. These adjustment periods are not often pain free times and can be very frustrating. The only thing you can really do to shorten those trials is to communicate clearly and often with your doctor. If something is clearly not working, make a phone call. Often they can make adjustments to your script over the phone. Another consideration is that your doctor may need to rule out other headache types and may prescribe certain medicines to test their effect on your pain. Indocin, for example is a highly effective treatment for hemicrania continua, a one-sided headache with symptoms similar to cluster headache. To rule out hemicrania, your doctor may prescribe Indocin over the course of several weeks. These trials are important because medicines that work for one headache type do not necessarily work for another. For example, high-flow oxygen has shown no benefit for migraine sufferers yet it works very well for cluster headaches. Comments: First-line preventative therapy for chronic cluster. Can be used in conjunction with sumatriptan and steroids. Extended release appears to be less effective against CH. Dosages above 600mg typically require ongoing EKG monitoring. Comments: Anti-seizure medication that appears to be effective in both migraine and cluster headache. 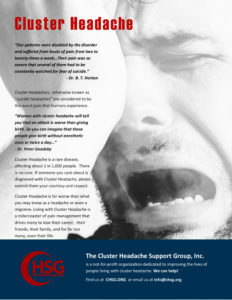 Anecdotal evidence shows a low efficacy rate for cluster headache. May cause confusion, fogginess, difficulty finding words. Primary indication: seizures in people who have epilepsy. Comments: Effective but high side effect profile make it less desirable. Primary indication: episodes of mania in people with bipolar disorder. Comments: May be more effective in patients whose cluster headaches are accompanied by migraine-type features. Very important – ask for Depakote brand name prescription to avoid confusion with valproic acid. Comments: Remains effective in the body for a longer period of time than other available triptans BUT another triptan cannot be used concomitantly as abortive.